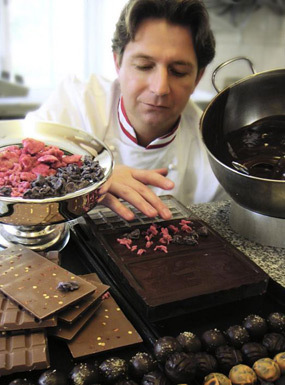 With the unique chocolate creations of Maître Chocolatier Johannes F. Bachhalm you immerse in the exquisite world of the Bachhalm Choco Culture – the most beautiful way to broaden your horizon of pleasure in a chocosensuous way. Since 1928 the „sweet knowledge“ and the artisan technique have been passed on from generation to generation. Maître Chocolatier Johannes F. Bachhalm combines this tradition virtuously with innovative impulses for unique creations and concocts his very personal Choco Culture. BACHHALM There are 49 products. Apricot Marzipan Nougat Pralinen Box, 100% handmade in Upper Austria and lovingly hand-wound. Violet marzipan nougat chocolates box, 100% handmade in Upper Austria and lovingly hand-wound. Infused with violet absolute and hand-sprinkled with candied violets, this Bachhalm Cuvee Dark Chocolate—an homage to the Empress Elisabeth (Sisi)—dazzles all the senses with its simultaneous qualities of innocence and intensity. Bachhalm Cuvee Dark Chocolate, hand-sprinkled with honey-caramelized almonds, hazelnuts, walnuts, pistachio nuts, and raisins. The abundance and variety of the daintiest nuts render this composition unforgettable. Bachhalm Cuvee Dark Chocolate with a sophisticated note of pistachio, hand-sprinkled with crunchy honey-caramelized pistachio nuts. A touch of Fleur de Sel rounds off this unique composition. Bachhalm Cuvee Dark Chocolate, perfected with the subtle aroma of blackberries. Hand-sprinkled with wild berry granules, blackberry granules and blackberry sugar, this chocolate presents berry flavours in perfection. Bachhalm Cuvee Dark Chocolate, finished with strawberry oil and chili oil, hand-sprinkled with delectable morsels of dried strawberries and green pepper. The tender notes of strawberry and chili make for a unique flavour experience. Bachhalm Cuvee Dark Chocolate, perfected with frankincense essential oil and white frankincense from Oman. This chocolate was created for Pope Benedict XVI. Finest Bachhalm Cuvée milk chocolate with the finest butter biscuit crunchy, fruity cherries and sugar snowflakes. Enriched with natural mango oil and hand-sprinkled with generous chunks of mango, papaya, pineapple, coconut, banana, sultana, almond and cashew nuts, this variety of Bachhalm Cuvee White Chocolate evokes the magic of the Caribbean. Bachhalm Cuvee Milk Chocolate, hand-sprinkled with honey-caramelized almonds, hazelnuts, walnuts, pistachio nuts, and raisins. The abundance and variety of the daintiest nuts render this composition unforgettable. Bachhalm Cuvee Dark Chocolate, finished with Arabica Espresso and hand-sprinkled with crushed Arabica coffee beans. A smoothly melting espresso chocolate experience. Bachhalm Cuvee Dark Chocolate, enriched with chili oil and hand-sprinkled with a mild yet flavourful variety of finely chopped Habanero chili: a sensory interplay of aromatic sweetness and spice. Bachhalm Cuvee Dark Chocolate with a sumptuous note of almonds, hand-sprinkled with crunchy honey-caramelized almonds. Bachhalm Cuvee Dark Chocolate with a sumptuous note of hazelnuts, hand-sprinkled with crunchy honey-caramelized hazelnuts. Perfected with mint absolute and hand-sprinkled with candied peppermint leaves, this Bachhalm Cuvee Dark Chocolate won a Silver Award of the Academy of Chocolate in London. Bachhalm Cuvee Dark Chocolate, enriched with the freshness of red currants, hand-sprinkled with morsels of dried apples and cranberries. The fruity acidity of red currants adds a refreshing twist to this Bachhalm Cuvee White Chocolate variation. Hand-sprinkled with pieces of strawberry, raspberry, and apple, it will delight particularly those white chocolate aficionados who favour a somewhat more restrained balance of sweetness. Bachhalm Cuvee Dark Chocolate, finished with rose absolute and hand-sprinkled with the queen of flowers: Candied Centifolia rose petals induce a royal taste experience.